I know I've got to get over my camera shyness to do the subject of Windows tablet art justice and remain competitive in this tech review space. But in the meantime, I hope you won't mind when I link to videos that do a great job for me. That's the case with this excellent comparison of the Surface Pro 2 and the Sony VAIO Flip 13 by Lisa Gade, Editor in Chief at MobileTechReview. In just under 17 minutes, she exhaustively reviews the pros and cons of each device and reaches much the same conclusions I did: if portability and Photoshop are a must, go with the Surface Pro 2 and if you need an ultrabook with art capabilities, go with the VAIO Flip. Like Lisa, my first observation about the Flip 15 was the excessive noise coming from the overtaxed fan, but I recently turned off indexing and now the fan rarely turns on. I also was having problems with frequent loss of pen and touch control which appears to have been resolved with a BIOS update from Sony's Japanese support site. I've cued the video up to begin with the pen technology comparison, but by all means watch the entire thing when you have time to spare. Lisa Gade compares the Sony Vaio Flip 13 and Microsoft Surface Pro 2 Windows 8 convertible tablets. And in case you're interested, Autodesk Sketchbook Pro 6.0.4 runs well and with pressure sensitivity. I had the chance to install two additional applications on the Sony VAIO Flip 15 A this afternoon and I'm sorry to report that neither program runs perfectly. Each stroke was created with a different pressure level, to no avail. The SAI UI is crowded and targets are not touch friendly. It doesn't really surprise me that pen pressure in Systemax's Paint Tool SAI v1.1 doesn't work. This version was released in 2008. I must thanks Twitter follower Dave Barrack (@grrlpowercomic) who explained that pressure sensitivity in SAI is set on a per brush basis under Advanced Settings, Hard <-> Soft. Unfortunately, no value from 0 to 200 yields a pressure sensitive brush stroke. The program doesn't have multi-touch support either, so it's not possible to pan or zoom with one's fingers. Though palm rejection works for the most part, it's still possible to create stray marks with one's pinky or knuckle even though the pen is also in the screen's proximity. There supposedly are more recent beta versions of SAI available for download, but I was unable to find them. The SAI interface is also not ideal for a tablet. Even on the Flip's ample 15.5 inch screen, touch targets are very small and need to be selected with the pen tip. UPDATE: Thanks to Twitter follower Yenny (@Nashoki44), I found the latest beta download for SAI 1.2b5. Unfortunately, that version did not correct the lack of pen pressure. 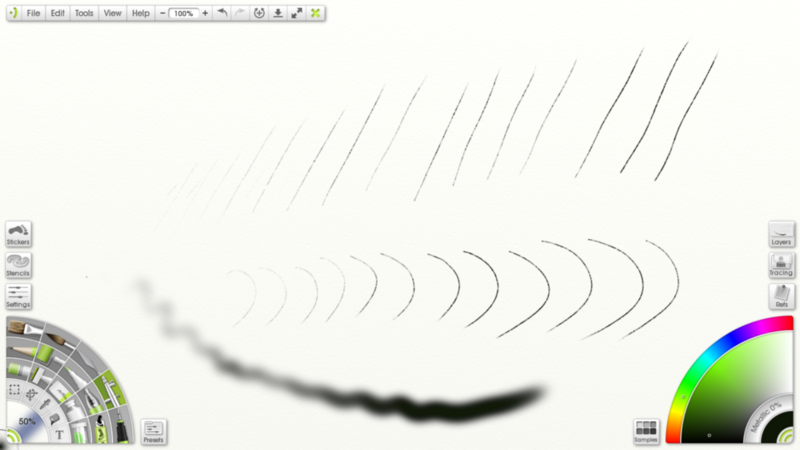 Pressure sensitivity works well in ArtRage 4.0.6, as does multitouch. Unfortunately, it's still possible for taps to leave stray marks. Although the latest update of Ambient Design's ArtRage 4 recognizes pressure and supports multi-touch with the N-Trig digitizer, I was disappointed to learn that it's still possible to create errant marks as you draw. If you need proof positive that pc manufacturers haven't a clue, look no further than Sony's decision to bundle ArtRage 3.5.5 Studio with each Flip sold in the U.S. I'm sure that retailers display that program when potential buyers ask about paint capability and I'm equally certain that savvy buyers will quickly cross the Flip off their lists based on its buggy performance. Any finger gesture may result in unwanted drawing and sometimes in the middle of a two finger zoom or even a pen drawing, unwanted lines will start shooting across the screen. ArtRage 4 has been out at least since the beginning of this year and it has far fewer issues. Why Sony chose to package the older version baffles me. If you can keep your pinky or knuckle from tapping on the screen as you draw, you'll be very happy with the results. Otherwise, you'll need to stay vigilant and frequently use Undo. UPDATE November 24: I'm relieved to report that the touchscreen issues described below appears to have been resolved by a firmware update released on Sony's tech support site. Kudos to TabletPCReview forum poster Miles Wolf, who first spotted the fix. I installed it yesterday morning from Sony's Japanese tech support site and haven't experienced the problem since. The bios update is now available on Sony's US eSupport site. Buried deep in most discussions of the new Sony VAIO Flip series is mention of the loud fan noise. But I believe this issue must be surfaced immediately because it might be the device's fatal flaw. In other VAIO models, fan speed can be adjusted in Sony's control panel, but that is not an option with the Flips. Like most pc's, fans whir up at startup and usually quiet down. But what's unusual about the Flip is that the fans will come on even when the device is idle. And if you're watching a video or working with graphics, they whir continuously. After a 30-minute session in a quiet room last night, I was afraid it would bore a hole in my skull. This video demonstrates the startup fan noise, but it's pretty much what you can expect to hear throughout your workday with the convertible. This video was shot in a noisy environment, right above a loud mini tower pc. Turn up the audio to hear the dramatic difference once the VAIO powers on. It's possible that this issue may be addressed in a firmware update, but I haven't seen any official word from Sony. The new convertible laptop is undone by fans that run too fast regardless of the activity being performed. This was shot in a noisy environment, just above a loud tower mini-tower pc. Turn up your audio to hear the difference once the Sony turns on. Like most of you, I've tended to dismiss tablets and convertibles that feature N-Trig digitizers that are limited to only 256 levels of pressure. However, I'm also first to admit that it's nearly impossible to distinguish more than a few pressure levels while drawing on the Surface Pro. The price and performance of Sony's Vaio tablets and convertibles is definitely appealing, especially with screen sizes ranging from 11 to 15 inches. I came across this video produced by Sony Vaio Duo 13 owner Scott Harris, which demonstrates Clip Studio Paint 1.2.7, ArtRage 4.0.5 and Sketchbook Pro 6.0.1 running very well at high resolutions. N-Trig drivers for Photoshop are still in beta, but if you don't require that functionality, I'd say the Sonys are definitely worth considering. Excuse my horrible quick sketches. I got a chance to test the Sony VAIO Duo 13, and made this video to show how awesome it's digitiser works for digital art. Check out my stuff on http://artofscottharris.deviantart.com Check out the ArtSketch.org review of this model here: http://www.artsketch.org/digital-art-revolution-the-sony-vaio-duo-13/ My personal verdict: Perfect for Art, especially with Clip Studio Paint.